Now it's about 15 years ago that I know you and your work with shakuhachi, mailing and inbetween having 3 of your beautiful flutes in my house. Our contact felt and feels always warm, directly and honestly, the base for something more than only a "business" of selling and order. The first flute came to me 15 years ago, it is a 2.4 jiari. I started to play "shakuhachi" and it was the right instrument for me, very good in tone and colour, easy to play meri and kari in all facets. Because my profession is painting and not music, it could be more than enough for the rest of my life. But "shakuhachi" started to grow into my life, so 12 years after I got this beautiful 1.8 jiari from you, absolutely a masterpiece and I'm very happy to hold this instrument in my hands. The 3.0'+ is just so magnificent! At first blow I felt the turning of the EARTH! I am so absolutely delighted with the 2.7 you made me. It is truly beautiful instrument to look at and hold. I love the way it feels in my hands. And the sound is lovely, deep, and complex. It voices beautifully across a wide range of air volume. And it has a wonderful depth of possibility: it invites: "get to know me well, and you and I can explore sonic realms you are just beginning to suspect exist." Just an exceptional instrument! I regard playing and listening to it as a treat for my senses. Thank you for your help, support and superb craftsmanship! Twenty years ago I began to play, collect and devote my life to bamboo, wooden, clay and bone flutes from around the world and from all time periods. I have owned over twenty different shakuhachi during this time span, always looking for the one that contained "my own voice." These instruments were made by both Japanese and American makers. I must say, my Monty Levenson Jinashi 2.4 shakuhachi ranks as one of the best instruments I own, giving me the closest sound to what I have been hearing in my heart for so long. It has richness and depth of tone, accurate tuning, and ease of playing. Like many of the best things in life, Monty's 2.4 fell into my hands by accident. As I got to know the instrument over several months of playing, I began to realize the sound I was looking for had found me. As I have now had the 2.5 Jinashi for sometime I feel I would be remiss if I did not take the time to write and tell you that this is by far the finest Shakuhachi I have owned and played; and I have owned many. 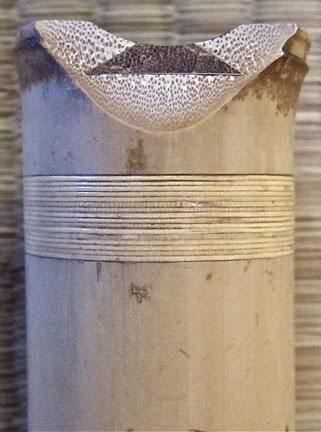 Aside from being expertly crafted from an exceptional piece of bamboo this flute achieves everything musically one could wish for in a Shakuhachi and most especially in a Jinashikan. It is an honor to have this flute; I thank you once again. The 2.8 Jinashikan that I received from Monty Levenson is truly a phenomenal instrument. The madaké bamboo is of outstanding quality both aesthetically and in its resonance capabilities. 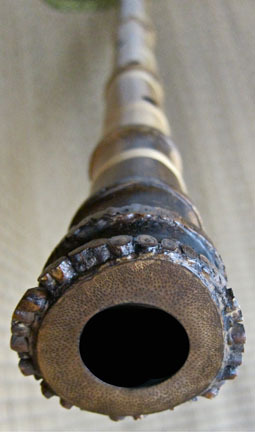 One of the first observations I made of this shakuhachi was to look down the bore of the instrument. I was taken back by the amount of work that Monty used to refine the bore. The internal smoothness gave me a glimpse of the amount of work and the methodical approach that Monty took in making this instrument. Playing this shakuhachi gave me further understanding of the instrument’s beauty. The resonance that Monty created on this flute is unlike any other shakuhachi I have ever played. The sound can literally feel the room with overtones. The volume on this large shakuhachi is surprising. Generally one would expect a shakuhachi of this length and bore diameter to be airy; however, this shakuhachi is the most refined and smooth sounding shakuhachi that I own. This 2.8 is capable of expressing very soft and delicate nuances of sound while transitioning into melodies that are boisterous and room filling. There are no problems for transitioning into the upper registers with this shakuhachi. In fact, the upper registers are smooth in transition without noticeable strain or airiness of sound. 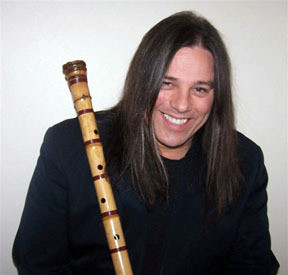 Overall, I am impressed with Monty Levenson’s ability to make a large jinashi shakuhachi come alive with such power, presence, and delicate beauty of tone. I look forward to many years of exploring the abilities of this wonderful shakuhachi. I must also add that Monty was a pleasure to work with and more than happy to respond to a multitude of questions that I had before purchasing this instrument. Monty, I could not be more pleased with the instrument you created for me. I have good news, the flute looks to be in excellent condition. You did a very nice job of packing it up. My biggest problem now is that the shakuhachi plays better than I can. I am amazed at how well all thenotes flow from it, very smooth and easy to make. I wish I would have had this flute all those years ago,I would be a much better player now. I almost have to re-learn everything, my other flute is so bad. 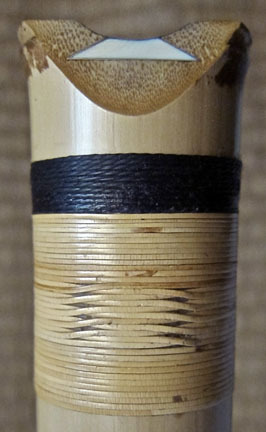 This flute is just beautiful, the inlaid rattan binding is Excellent, the root end Excellent, the slight flute bend I wanted is Excellent, sound Excellent, I love the dark patchs down the length of the flute , they look like sumi-e brush strokes, Excellent. Looking down the bore I can see all the detail work that you put into this flute. Overall the whole flute is, well, EXCELLENT. I just love this flute. You have done an outstanding job on it. I made the right decision to go with yourshakuhachi Monty, I am very happy with your work. While I am not a "Pro" shakuhachi player (not yet, lol), it sounds beautiful to me, but I do know Quality when I see it, and your shakuhachi speak volumes on quality. Have had the shak for 3 months now, and thought I'd send a "progress report". My initial assessment of it hasn't changed, basically, but if I had it to say now, I'd say the same things I said initially, but about to the power of 10. The subtlety and power of which the flute's capable are almost overwhelming, at times. A friend inquired about it, asking me to compare it to the shaks I've been playing for years (he wanted to know if I thought it was worth the $$). As he's a car-type, the most succinct metaphor I could come up with was that the old flutes are like stock cars, while the new one's like a Formula One racer. They're all cars, but drive the Formula One just once, and the difference in quality and performance is stunning. In fact, in carrying out the metaphor, I told him that I had to almost learn how to drive, all over again. That by handling the new flute in the manner I handled the "stock car flutes", I was "oversteering", &c. - that the power and subtlety of the instrument was forcing me to revise - very positively - my entire approach to playing. I've learned so much from playing your shak that it's kind of scary. The power of the instrument's amazing, even when introducing (pushing's too coarse a word) an almost infinitesimally small air flow into it. For the first time, I realize (can make real) the idea of exciting the air in the tube to resonate, rather than "blowing" the flute. Lately, it feels as if we're right on the verge of being able to excite vibration by intention alone. The air stream can be so fine (and finely directed), that the sensation's close to "breathing out intention", rather than breathing out a column of air. Yet the volume, projection, and tone remain strong. That's profoundly liberating, for a player. The subtleties that the flute can produce when excited that way are phenomenal. I swear there are times when the notes feel like they're moving neither up nor down, but sideways! I remember reading, somewhere, that some of the really hot Japanese players can distinguish up to 64 notes per octave on a shak. With your flute, I've absolutely no problem believing that. But, the subtleties aren't limited to note gradations. The "playing effects" on the notes that the flute's capable of are pure joy, for me. Can't tell you how much fun I'm having with the thing. On the other hand, when I'm in a feisty mood and need to blow hard into the thing (which happens), it can take whatever I throw into it. I do have to take care - both on the high end of the hard blowing and the low end of the intending - to be exquisitely conscious of the airflow placement - or, of course, the tone will disappear. But, even when that happens on the high end of blowing hard (it does), the sound of the pure breath in the tube keeps the music going - if I respond to the change well enough. There are times when I'll purposely play whole passages with just the simple pure breath tone - 'cause it's cool. Haven't quite figured the analogous trick on the low end of intending, yet - but I'm playing with it. The weight/density of the flute through me a curve at first, as it didn't "buzz" in my hand when sounding. 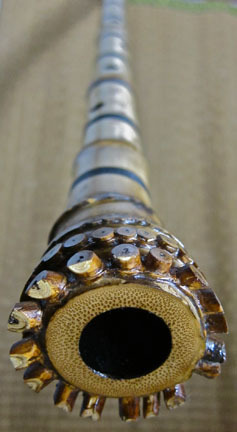 It didn't take long to understand that all the energy was going to making the tone richer inside the bore, rather than having some of it dissipate through the walls of the flute. The various qualities of tone the flute's capable of continually draw me into further discovery. I'm actually getting tones that - for once in my musical life - I'm real happy with. And, I know they'll only get richer and more profound as time goes on. If it's possible, my admiration for 'Trane's tone is even greater than before. The semicircular utaguchi you put in is just perfect, as I can direct the airflow from the center of the playing notch all the way to both ends to the utaguchi (almost to the end of the playing notch, itself). That allows a greater variety of tonal and pitch changes than just playing in - and very near - the center of the notch. Thank you for the flute. You, my friend, are truly a master of your art. Not just in the sense of having mastered what the flute makers before you did, but in adding - significantly, I'd say - to the art itself. It's a privilege, as well as a pure pleasure, for me to be able to play this flute of yours. I hope to be able to grow my playing so that it'll be of the quality I feel the flute deserves. (That's a great excuse for me to play it as much as I do.) And, I know that your flute making chops will continue to grow with time. That's awesome. If I ever get to "the end" of what this flute and I can do together, I'll show up at your place - looking for a more advanced flute to learn from. Though, with the quality of this one, that may never happen. I hope all's well for you, and that your summer unfolds beautifully. Thank you, again, for the exquisite instrument.